In 2015, saxophonist Huw Wiggin’s recital was the highlight of the Brighton Festival’s lunchtime concerts, and the following year he returned with the fellow members of the Ferio Saxophone Quartet to wow audiences once again. 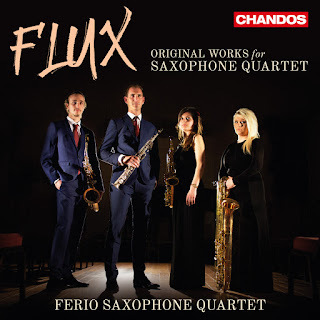 So it’s great to see that they now have a recording contract with Chandos and have launched their debut commercial disc with a wonderful programme of original works for the saxophone quartet. The centerpiece of the disc is a set of six Cíudades (Cities) by the Dutch saxophonist Willem van Merwijk, under his composing pen name of Guillermo Lago (b.1960). They performed a selection of these at that Festival gig, and the persistent energy of Tokyo, the mournful, eastern inflections of Sarajevo, as well as the bustling Addis Ababa struck me as highly evocative then. So it’s great to hear the other movements, such as the rhythmically driven Córdoba with its contrasting slow sections, and the Piazzolla-esque slow tango, Montevideo. The quartet inhabits each of these cities, and communicates their evocative moods well. They clearly like Lago’s music, as they have since commissioned another work, ‘The Wordsworth Poems’. Lago’s writing is very atmospheric here too, and the quartet exploits some very quiet playing in the first movement, ‘Composed on Westminster Bridge’, to great effect. The disc opens with an altogether more sedate affair, a delightful Grand Quatuor concertant by the Belgian composer Jean-Baptise Singelée (1812-1875), with great melodic invention, allowing each instrument to shine. This is followed by an elegant set of variations on a jaunty little theme, the Introduction et variations sur une ronde populaire by Gabriel Pierné (1863-1937). This earlier, more Romantic repertoire allows the quartet to demonstrate their ability to create a beautifully unified, warm tone, as well as bring each instrument to the fore when required. The recording is rounded off with a lively Hoe Down by Will Gregory (b.1959) (of Goldfrapp fame), showcasing the baritone sax amid the dancing rhythms. Even if you don’t think you like the saxophone (although why wouldn’t you? ), this deserves attention for the sheer variety of repertoire and the impressive talent of these four players. Highly recommended. Various. 2017. Flux: Original Works for Saxophone Quartet. Ferio Saxophone Quartet. Compact Disc. Chandos CHAN 10987. 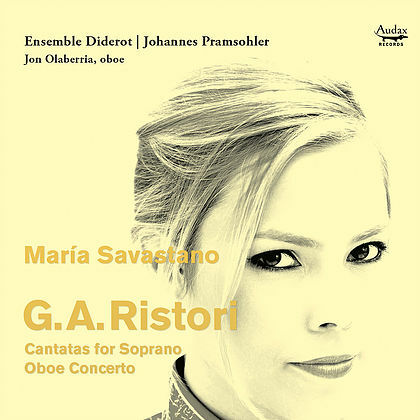 Johannes Pramsohler and his Ensemble Diderot bring us more rare Baroque repertoire, this time by another forgotten Dresden composer, Giovanni Alberto Ristori (1692-1753). They are joined by Argentinian soprano, María Savastano, and Spanish oboist Jon Olaberria. The bulk of the disc is taken up by three cantatas, with libretti written by Bavarian princess Maria Antonia who joined the Dresden court in 1747 when she married her first cousin, the Crown Prince Friedrich Christian. Ristori’s settings of these three monologues are lively and full of dramatic interest. There is the familiar story of Dido, abandoned and in despair, as well as the tale of Lavinia (also from the Aeneid) who is promised in marriage to Aeneis, and so is forced to leave her fiancé Turno (who Aeneis then kills!). The final story is a simpler tale of Nice’s woes over her absent shepherd lover Tirsi – and here we have a happy ending, with Tirsi taking the shape of a solo oboe for a final love duet. Savastano has a powerful, dramatic voice, and she gives full vent to the heroines’ passions. There are long passages of recitative, yet these are filled with emotional word-setting, underpinned with dramatic instrumental flourishes. In ‘Didone abbandonata’, Dido is a much angrier, even defiant heroine than Purcell’s rather passive characterisation, and again, Savastano relishes the passion in Ristori’s writing. But the height of dramatic pace has to be Lavinia’s final aria from ‘Lavinia a Turno’, with wildly exciting, racing strings, and a tour de force for the soprano. Savastano’s virtuosity is very impressive here, yet she also demonstrates a gentler side in the final duet of ‘Nice a Tirsi’. Olaberria’s sensitive playing also sets us up nicely for the final work on the disc, a delightful Oboe Concerto. The writing for the oboe is delicate yet intricate, and Olaberria makes this sound deceptively easy. His graceful touch in the slow movement is also lightly matched by the strings, and the courtly finale rounds things off beautifully. As ever, Pramsohler and the Ensemble play with precision and great energy, making this yet another successful addition to their growing catalogue celebrating unknown gems of the Baroque repertoire. Ristori, G. A. 2017. Cantatas for Soprano, Oboe Concerto. María Savastano, Jon Olaberria, Ensemble Diderot, Johannes Pramsohler. Compact Disc. Audax Records ADX 13711. Max Reger (1873-1916) has been receiving a bit more attention of late, following the 100th anniversary of his death last year. Unlike the prevailing direction of early twentieth century Germanic music towards the atonality and serialism of the Second Viennese School (Schoenberg et al), Reger admired and very much followed in the footsteps of Brahms, and this is most evident in his three Sonatas for Clarinet and Piano. In fact, it is said that hearing a private performance of Brahms’ F minor Clarinet Sonata in 1900 led him to state there and then that he would compose two sonatas for the instrument, which he proceeded to do in a matter of months. 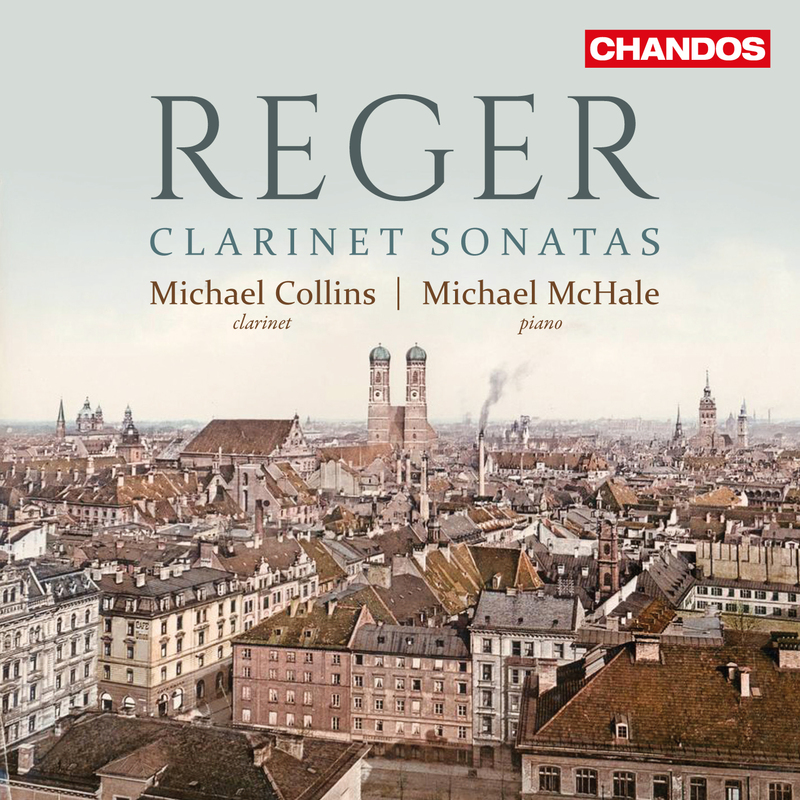 He wrote one more Clarinet Sonata in 1908, and all three have been recorded here by clarinetist Michael Collins, with Michael McHale on piano. They begin with the later work, the Sonata Op. 107, a weighty work at just over half an hour (the earlier Sonatas coming in at about twenty minutes each). 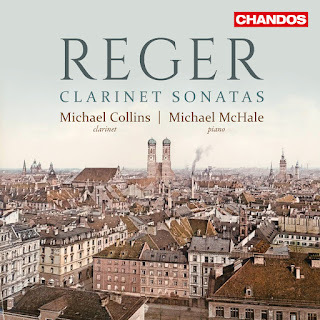 It is full of Reger’s characteristic rich, wandering harmonies, and like late Brahms, he exploits the dark lyricism of the clarinet to great effect. He ends with a sunnier, playful if slightly rambling finale, although this concludes in a slower, more reflective mood. The Sonata Op. 49 No. 1 has a turbulent, rather agitated opening movement, and both Collins and McHale give this great passion. The strange harmonies of the slow movement’s opening bars are followed by some beautiful rhapsodic playing from McHale in particular, with Collins sailing lyrically over the top. Turbulence is never far from the surface, and although Reger never quite finds the moments of sublime beauty that his idol Brahms achieved, this is nevertheless fine chamber music that deserves greater exposure. The Sonata Op. 49 No. 2 has another extensive first movement, followed by a bright, fleet-footed scherzo, delivered here with dazzling panache, again with McHale having the most virtuosic part to play. Throughout, Collins and McHale bring out the melodic and harmonic interest, never allowing Reger’s slightly rambling style to lose direction. Reger, M. 2017. Clarinet Sonatas. Michael Collins, Michael McHale. Compact Disc. Chandos CHAN 10970.